today is the last day of summer vacation. I have had a remarkably happy and enjoyable few months, not just because I got married (and had a wedding, which I now realize the purpose of is to get everyone you love to hang out with you) but also because I did every bit as much carefree running, ocean swimming, bike riding, peach-eating, and dog-snuggling as my heart desired. somewhat unlike a summer spent traveling or working on big projects, this one has left me with an unprecedented feeling of satisfaction. as much as I would like to continue making spontaneous beach trips on weekday mornings, the mere fact that I have been able to do that for the last nine weeks clearly means that I have nothing to complain about. and while the water is still warm — almost eighty degrees this week — the air is starting to bite a little on the way out. so, back to school we go. principal: …in east new york. for a long time, the new neighborhood seemed like the end of the world: distant, dangerous, crime-ridden. a significant number of staff members purchased cars or made plans to start driving to work, a change that made me dizzyingly ill and still does if I think about it too much. (the walk from the subway is barely more than a mile, far by new york city standards, but completely doable. there are also buses that come much closer.) those of us who remained committed to the bike ride — from my house, it is about twice as far to the new building as it was to the old one — swapped horror stories about the dearth of bike lanes, dodging trucks on the four-lane linden boulevard, riding along torn-up pavement beneath the clattering menace of elevated train tracks. this is what the first half of my ride looks like, three miles straight down the eastern parkway bike path, and this time of the year, straight into the sun. my old route hugged the brooklyn waterfront, along a beautiful but relatively desolate path where I mostly just saw other bike commuters. 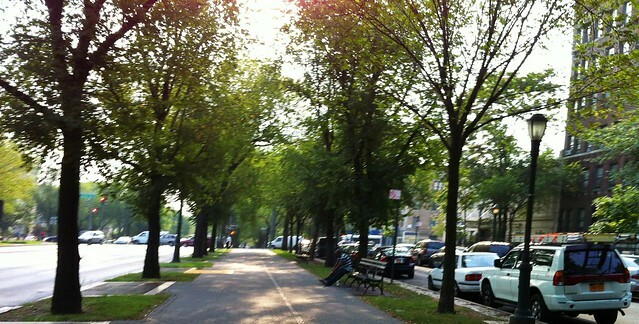 eastern parkway, though still a bit sleepy before eight in the morning, is a major pedestrian thoroughfare. I imagine it will be frustrating at times to be constantly watching out for people dashing in and out of the subway or walking in the wrong lane, but so far I rather like the touch of humanity that crown heights has given my commute. at the end of the greenway, I plunge downhill into the streets of brownsville, where the oaks and maples give way to crape myrtles and weeping willows. it’s a neighborhood I haven’t spent much time in, but I love riding along its wide streets, past churches and housing projects and playgrounds and bodegas. in the morning it’s quiet and I can say hello to every driver who waves me through an intersection and every pedestrian who crosses in front of me while I balance on my blue pedals. it’s embarrassing to admit, but I didn’t know much about east new york beyond my trips out to the UPS facility and its reputation as the homicide capital of brooklyn. it’s true that my ride to work takes me past a few garages and warehouses, and also true that the crime statistics aren’t the prettiest. but… that’s not really what it’s like. 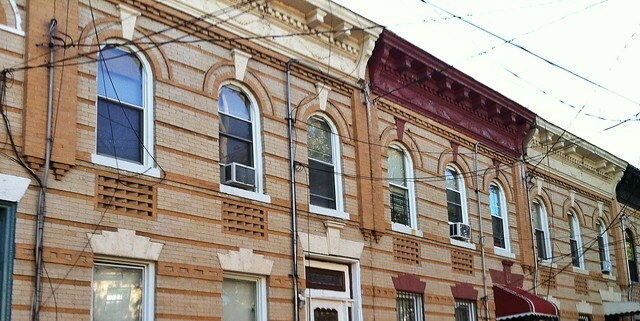 what I see on my bike ride: neat little row houses, many with pretty gardens in front; children playing hide-and-seek in garage doorways, or a mysterious hopscotch-like game that seems to be permanently spray-painted on to the street; pitbulls dragging their owners down the block; and even the occasional someone else on a bicycle. there is an odd sense of otherworldly detachment, once you get past the trainyards and across the boulevard, as if it could be any day or any decade. but it’s a sweet detachment, filled with godliness and friendliness. I am wished a blessed day every time I go to work. there are train tracks to ride under, but they are flanked by an ever-present basketball game (in the middle of the street) and a plaza with scattered, brightly colored chairs where senior citizens eat their deli breakfast sandwiches. the clatter of noise comes more from the hollers of the kids shooting hoops and people greeting each other as they leave the station than it does from the train itself. as commuting goes, I have to say, I really don’t hate it at all. Posted September 3rd, 2012 in bicycle bicycle where are you going. I am constantly picturing the collision that will kill me. riding in cars, I watch for the driver who will run the red light and plow into my passenger-side door. on my bike, I look down every street that I cross and even when there is nothing coming, I see the speeding car that smashes me sideways into the path of oncoming traffic. I see it as if I’m watching myself from behind: the impact, the noise, the spray of shattered plastic, the parabola of my body’s flight through the air. I never quite see anything hit the ground. so it’s legitimately ironic, I think, that when an SUV ran me down on my bicycle last week, it drove into me from behind. I saw nothing until it was on top of me. I was riding home from work, perfectly in the middle of the bike lane on franklin avenue, approaching but not yet at the point where the street curves just slightly to the right. then my handlebars were yanked out from under me as they caught on the side of the SUV for a split second before there was no space at all between my body and the warm metal frame of the car. I know I screamed, but not with words — I often yell at drivers when I need them to notice me, but this time there was nothing left to be avoided. the car had hit me and I was about to hit the ground as I fell I was watching the space between the undercarriage and the pavement, hoping that my head would slip beneath the car after the rear wheel and not before it. there’s only so much a helmet can do. I landed just behind the tail of the SUV with my bicycle still between my knees. I got up and assessed the damage: blood all over my legs, asphalt imprinted on my wrists, but nothing broken. chain dangling, derailleur a little bent, brake pulls stripped of paint, but nothing broken. by this point another cyclist had pulled to a stop behind me and the driver had emerged from her SUV, and suddenly things started to get weird. I knew I wasn’t thinking straight, with my heart still racing and my veins more full of adrenaline than hemoglobin, but it was clear that something was not right about the person who had just driven her car into my side. her belt was threaded through only one side of her pants, and the buckle flopped against her calf as she walked towards me. she looked dazed; glazed. it was 2:30 in the afternoon. “I don’t know what happened,” she said. what happened, I thought, is this two-ton machine of steel and glass and horsepower was being operated by someone who couldn’t even understand the spatial relationship between it and the road. I had no idea what to do. never having owned a drivers license or car insurance, I wasn’t sure what was supposed to happen after an accident. but I was the only one in control. I told her what had happened; I told her what would happen next. exchange contact information. names. write down your license plate number. she kept trying to pick up my bicycle instead. mercifully, someone who’d heard my screaming had called 911 and when the cops showed up, they took over. the EMTs tended to me while the police questioned people. one of them popped into the ambulance to take my statement and let me know how to get a copy of the report. by then I just wanted to get home — my dog was waiting, alone — but I found out later that the driver of the SUV was charged with a DUI. alcohol and prescription drugs. I felt oddly as if the world was working properly for once, with all these strangers looking out for me: the woman who stopped her bike ride to make sure I was okay, then stayed and held my bike for me while my wounds were being cleaned and bandaged; the guys who ran out of their building to make sure the driver didn’t get away; all the people who gave me their names and phone numbers in case I needed witnesses later on. brooklyn taking care of me. “watch out for cars!” he said. the cars don’t watch out for me, most of the time. I know that. I dodge a potential crash every day, probably, and it doesn’t bother me because I can see them coming. I’ve been a bicycle commuter on and off since 1995, when I started high school, and in fifteen years and literally thousands of rides I’ve been hit twice and doored twice. I thrive on the assertive, decisive style of riding that city traffic demands; while I hate cars, I understand what my father loved about driving a cab in new york. on tuesday I biked along that same stretch of road for the first time since the accident, and was surprised to see that in the spot where I was hit, the bike lane and the car lane are separated by a four-foot buffer. I suppose it’s lucky in a way, because I landed in that no-man’s-land part of the street instead of directly in the path of oncoming cars. but it also means that the driver who hit me was in the wrong place by nearly 100% of the width of her SUV. I was shocked to find a pair of long white scratches in the asphalt that must have somehow come from my brakes being scraped across the street. did my back wheel come off the ground? it must have, but I don’t remember. closer to home, I was riding in the bike lane when a sedan cut directly across my path to swoop into an empty parking spot. I stopped, hard, but could still reach out to bang on the side of the car. and I yelled, but with words. watch out, everyone. just watch out. for bikes, for cars, for people. for each other. Posted September 10th, 2010 in bicycle bicycle where are you going. You are currently browsing the archives for the bicycle bicycle where are you going category. wockerjabby: powered by wordpress and headless.